Bestselling author Temple Grandin sees the world differently. She has used her autism to bring enormous change in how livestock are handled. She’s also used it as a beacon for individuals, their families and agencies worldwide who are confronting and embracing autism. That’s innovation, says Professor Jim Falkiner, who teaches courses in entrepreneurial thinking and entrepreneurial skills for Manchester University. On Thursday, March 6, Temple Grandin – a professor of animal sciences at Colorado State University – will address students of Manchester University. The public is invited to the free 3:30 p.m. presentation in Cordier Auditorium on the North Manchester campus. Reservations are not necessary. Grandin is Manchester’s 2012-2013 Innovator of the Year. Falkiner will open the presentation by honoring Grandin for her innovative approach to animal science and succeeding with autism. One in every 88 children is autistic, which affects people in all ethnic, socioeconomic and racial groups, according to the Centers for Disease Control and Prevention. Autism is five times more common in boys, reports the CDC. She is author of several bestsellers, including The Way I See It: A Personal Look at Autism and Asperger’s, Unwritten Rules of Social Relationships, Animals Make Us Human and Emergence: Labeled Autistic. After her Manchester presentation, Grandin will sign her books, which will be for sale, in the Cordier lobby. Manchester University offers a Certificate in Innovation that teaches problem-solving skills that help students understand how to take charge of tough situations. For more about the program, visit idea.manchester.edu. Grandin’s Manchester appearance and the Innovator of the Year award is made possible by the Mark E. Johnston ’68 Program in Entrepreneurship. 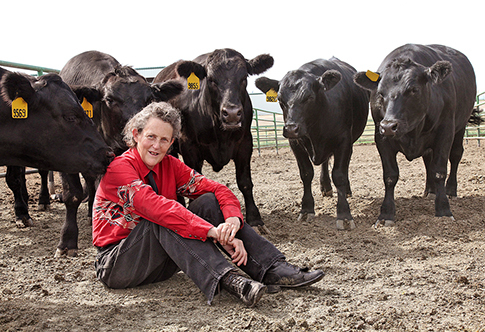 Live Video Feed of Temple Grandin March 6 3:30 p.m.